Has it really been almost two years since the last RTP? That’s twice as long as Eccleston’s entire tenure and longer even than Voyage of the Damned feels to watch. This time-span means that RTP not only offers us bang up-to-date analysis of River Song’s logic-defying journey (thank you Jamas, you’ve made me feel so much better by pointing out that she actually married a robot), but we also have the conclusion to a strip and brilliant story starring The Tenth Doctor with his blonde and ginga companions, respectively. Dave Ronayne’s concluding part of Weapon of Choice is a thing of beauty, and perhaps more timely than could have ever been imagined due to the recent screening of Cold War. But what really makes this piece of fiction a pleasure is that the man really can write, as also evidenced in his Fanboy Confidential piece whereRonayne even makes the sentence “So, yeah, I just don’t know.” sound eloquent. Personally, Fanboy Confidential has always been my favourite regular RTP feature because it invites the opinion and experiences of a range of fans, but unlike a toxic on-line forum, forces the contributors to express themselves with a degree of thoughtfulness, wit and personal affection for the topic. I suspect participants might sometimes find Fanboy Confidential a self-revelatory or at least cathartic experience, it’s certainly always a great read. Lastly, I can put off addressing a certain artist, writer and cartoonist’s colossal contribution no longer. It’s a Herculean effort which astonishingly still manages to put quality over quantity. Peter Adamson takes us from Stockbridge toNormandyand then leads the charge through the aforementioned Fanboy Confidential with a delightful collection of orthodontically-challenged caricatures (character options –release them as action figures now!) And someone please release that Stockbridge map as a poster while they’re at it – gorgeous work. Throw in my all-time favourite Karkus strip (and that’s really saying something) and RTP 30 is more than worth the long wait. As Alex says in his editorial, the next issue is planned as a celebration of the programme’s 50th Anniversary. I urge everyone to take the opportunity to become a part of this very special event by contributing. Think of how proud you’ll feel when your children ask you: “What did you do in the 50th anniversary year Daddy?” and you can proudly brandish your RTP 31 at the little scamps. I’ll certainly be on board. It’s anniversary year, and what are you doing for fandom? The promising news is that it looks as though things are afoot locally for fanzine publishing. Here in New Zealand we still seem to be doggedly sticking to print format, and that’s fine for those who like that sort of thing. Older fans like myself will still remember the frisson of excitement when an A5 envelope drops through the letterbox (more often than not on a wet day) offering the promise of a good evening’s read that you can dip into and out of happily. The best TSVs, Teloses and RTPs of the past were made of this stuff and I like to think there was something in Zeus Plug sticking to its guns in old-tech as well. We may yet see our local zines published in digital download only – certainly the know-how is there and has been practiced by both editors; but for that to happen of course, we need to know that there’s a future for these titles. That’s where the aforementioned “promising news’ demands more scrutiny. At the time of writing RTP issue 30 is around ten pages shy of a full issue, and once these are provided will go to press, it is hoped, in time for the return of the TV series. I’ll leave further promotion of that to editor Alex, but will say that besides Alex’s usual hard work and attention to detail, the next issue comes about through the efforts of RTP’s main writers, familiar names all. The same can be said for the most recent issue of RTP, and it’s the frustrating ubiquity of that set of writers and illustrators that prevented RTP 29 from being reviewed on this blog. A shame, but we felt it wouldn’t have been honest to do the job ourselves. It’s the nature of fanzines, and is possibly exacerbated by NZ being a small country, but the only way to fix this problem is to acquire new readers and contributors. There’s an anniversary issue of RTP planned for November of this year – the first year in several where more than one issue will come out. Hopefully the occasion and any promotion of the zine will see an influx of new talent. We know it’s out there. So that’s RTP, what of TSV? Your humble scribe has no information further to that which he reads on the NZDWFC Message Boards. Apparently there’s interest in an issue, and TSV’s current editor Paul has said he’d put an issue together provided the content is there. Like RTP however, I feel the situation for TSV is grim if such a passive approach is to be taken by all. Put simply, TSV has a driver (abeit with his own limited free time) but no evident drive; the scenario is less “build it and they will come” and more “leave some tools about and hope for some passers-by”. There was talk of TSV launching a charm offensive when the series returned in 2005, to re-energise the Club (as was) and revitalise the zine. Some good issues came afterwards, and new faces featured to the credit of Paul and Adam McGechan, although it remains to be seen whether this was on the back of any promotion or whether it was the last burst of a sustained period of goodwill from its past contributors. Now we’re older and poorer in time, with less incentive to put things together. Speaking for myself RTP appeals as an outlet because it’s an established structure with a committed and available editor, better odds than putting together a Zeus Plug issue at this stage. But it also appeals because RTP is a labour of love between a small group of like-minded friends. It has never been the official organ of the national club, and arguably has survived this long because of this degree of intimacy. Though its profile is far better, I do wonder whether TSV has a harder hill to climb, committed as it seems to be to higher page counts and a broader market. I’d love to be proved wrong, and I applaud the efforts of the likes of David French to get things going, but the rest remains to be seen. And what of Zeus Plug? Well, never say never I guess. For the time being we’ve nailed our colours to RTP’s mast out of habit and past loyalty (and the reasons stated above). But it’s the Fiftieth Anniversary for heaven’s sake – the reason many of us are doing this at all is because we know we’ll kick ourselves come November if we didn’t get off our chuffs and put something together, commemorative or not. Who knows – it might be the last year a fanzine gets published at all in this country. So what about you? What are you doing for anniversary year? The role in which Doctor Who Weekly and later Doctor Who Magazine has played in Who fandom is one which cannot be underestimated. In 2009 it celebrated its 30th anniversary, and this year the title becomes the longest-running official magazine based on one television show. Despite having arrived rather late in the game during the last years of the Tom Baker era it has survived Doctor changes, dwindling television ratings, a publishing collapse of Marvel UK, the two distinct stages of Who fandom’s own Wilderness Years, pre and post 1996 TV Movie, and now stands a true success story, flanked by sister publications for its spoin-off shows and a junior title. More importantly, beyond its longevity and tenacity the magazine can truly be said to have had and continue to have an influence on fandom, and even on the show. Without The Star Beast it is argued there would be no Smith and Jones. Big Finish have produced audio adventures with comic companions and villains alongside their ‘official’ television incarnations, and of course past and present letter writers and contributors to the magazine now feature in the credits of the new series. In short, DWM is one of the pillars of Doctor Who fandom – it’s a big deal, and it’s loved. 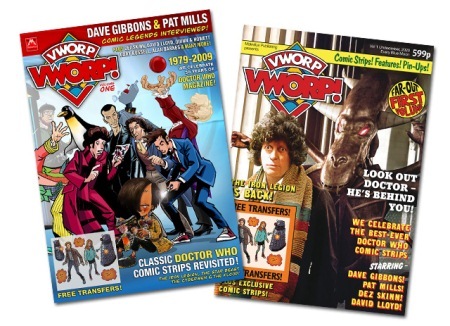 Vworp Vworp, whose onomatopoeic title was coined in the magazine’s own strip, is a love letter to Doctor Who Magazine, and a better-written one you’d be hard-pressed to find. It’s beautiful, from its alternative colour perfect-bound covers – one a collage of the magazine’s past and present cartoonists and artists featuring a Doctor apiece, the other a photo mock-up of initial strip The Iron Legion, to its irreverent letter’s page and its faithfully produced transfers stuck on the front (just like in issue one, but with Matt and Karen instead of Tom). Everything down to the retro tyopefaces and page layouts seems meticulously chosen, yet the zine is no mere facsimile. There’s room to gently mock the conventions of the early issues (a particularly bonkers ‘Letter from the Doctor’ included). Coverage-wise it tracks down a lot of the early, big names – Skinn, Bentham, Howe, Pixley, plus creative partners Pat Mills and Dave Gibbons deconstructing the opening episode of The Iron Legion, and later Adrian Salmon, Scott Gray, Martin Geraghty and Alan Barnes’ on final Eighth Doctor strip The Flood and Salmon and Barnes’ early collaboration Cybermen. The latter article’s been interesting for me to revisit that strip, at the time so revolutionary with the artwork and minimal storytelling, yet at risk of being overlooked simply becuae of its unconventional nature – having no Doctor and a plot which veered toward the surreal in places, its chances of appearing in a Panini trade paperback are slim for the mean-time. Thanks be to Vworp Vworp‘s enthusiasm then, for giving Cybermen a worthy platform. The zine’s original comic strips, Time Leech, The Master’s Life on Mars and Daryl Joyce’s Ice warrior/Silurian face-off vary as you might expect between cartoonish and highly skilful. I’m not sure which of the three I prefer, although Joyce’s is certainly the nicest to look at, it’s slight and begs for more instalments. On the other hand I’m unsure whether more episodes are intended, and to that end am reassured that Time Leech lives on through the creators’ Kasterborous site – serialised fiction of any kind is too often the abandoned child of a short-lived zine. Not that Vworp Vworp promises to be a one-off, as the brilliant news is that its creators have a second issue in production, including a feature interview with Steve Parkhouse and look-in on The Tides of Time. With issue one being so very full of DWM‘s names, faces and stories you’d be forgiven for thinking there’s little left to cover in another issue, but in this case I’m left with no doubt that editors Colin Brocklehurst and Brian Terranova will surprise and delight us yet again. For the first time ever, I’ve just read some Who fan fiction – in a fanzine – and really enjoyed it. To be completely honest I don’t normally read stories without pictures in any Who publications, but now I realise that I might have really been missing out if any of it was nearly as good as part one of David Ronayne’s Weapon of Choice. Dave writes Donna beautifully, giving her some lines that would surely make the programme’s writers green with envy. So, a revelation then, just as RTP usually is. Issue 28, (in which the ‘P’ in the logo surely stands for Peter Adamson, given the sheer volume of his contributions), is no exception. And what about that gorgeous map of Stockbridge? My first thought was how much I’d love to see it in colour, although perhaps that wouldn’t really add anything to this exquisitely researched and drafted illustration. Really beautiful work, accompanied by an equally thorough article. The Tides of Time was one of my first experiences of the DWM strip, so I have a great affection for the Stockbridge stories and suspect that many other readers might, too. To be honest, listing what’s particularly good in RTP is an increasingly pointless, to say nothing of lengthy exercise, but it’s perhaps worth mentioning that what always was good appears to be getting even better. I’ve whined in the past about some (to me) odd typographical decisions, but this issue features some nice work with headings and layout. This leads me, however, to my one tiny gripe. I like the comic strip The Tower of Angum – the Doctor and Rose are well in-character and the composition of the page frames keeps the story flowing well. Unfortunately the heavy weight of the typeface used in the speech balloons has the unfortunate effect of making it look as if everyone is SHOUTING at each other – even in quiet, thoughtful moments. Maybe appropriate for Colin’s era – and Tennant after all, come to think of it! Despite this – keep up the great work – I know what a massive effort producing strips can be, and it’s always great to see them. Fanboy Confidential is always unmissable – and it’s nice to see the main illustration re-sampled throughout the article. The poster of Eccleston and Piper is absolutely priceless – Adamson shows again what can be achieved with the barest minimum of line and a sense of humour. The two interviews show that New Zealand has produced creative people associated with Doctor Who that are every bit as interesting and accomplished as those living overseas. Stand up and be proud, New Zealand – which seems to be an unofficial mandate of RTP. 2009 seems to be rushing towards its conclusion, and as Santa and Snoopy approach all I want for Christmas is a festive RTP 29 – and at least one illustration to accompany part two of Weapon of Choice. After a fourteen month wait between issues, any negative review seems like kicking an invalid while he’s down, but with TSV’s letters page gone without trace, and this issue release provoking barely a ripple of comment on the boards, TSV’s readership seems to have checked their critical faculties at the door. (with rare exceptions) This seems a shame as silence may be interpreted as assent. Once again we have a wrap-around colour cover. Opinion may be divided on the merits of the artwork, apparently done as a “rush job” at least six months ago (described by one fan as “Peter Davidson, his ventriloquist’s dummy, and a wall of floating heads”; and by another as “the baby-poo brown issue”), but the real concern is if any visual advantage is offset by the loss of 12 pages of material. Don’t get me wrong – it’s great for a special issue, but given the time, effort and cost, (and that there only seem to be a couple of contributors willing to do it) is it really justified? Preddle at Pendraw Place was a nice, very personal piece of work. If the editorial staff are keen to introduce a greater UK perspective to the dusty old NZDWFC zine more of this kind of thing would work nicely. Full marks. We then roll into the feature interviews of the issue, starting with Peter Davidson – The TSV Interview. This piece was surprisingly refreshing in its outlook, focusing on Davidson’s recent work in Time Crash, and his perspective on the new series rather than well worn anecdotes from 25 years ago. The only fault with this is that in some points it highlighted the age of the interview (the Georgina Moffet comments particularly), and it’s presented in an odd style that, while avoiding the traditional question/answer format, does seem to let the interviewer’s questions and comments run into those of the subject, making difficult to see in places where the interviewer’s supposition stops, and the interviewee’s comments start. This problem also permeates Tony Hadoke – Moths Ate My Doctor Who Scarf, although it seems less noticeable in the shear verbiage of the piece. Don’t get me wrong, I like Hadoke and enjoy his work, but even with this the interview seems to ramble (I shudder to think what anyone who didn’t have context to hang all this on would’ve made of it). Some more comments and observations on the series itself or his Who (non-acting) background would’ve made it more accessible, and while it was great for him to offer up so much time and effort for us, as he himself notes – sometimes cutting out stuff you love is the key to success. (It’s also interesting to note that the two interviews are of different font sizes. It seems odd that the shorter interview was in a smaller print while the longer one was much bigger – seems like padding). Sandwiched between the interviews is a local Con report, which again, age does not help (almost bang on a year); but also highlights what a missed opportunity it was not to interview Kate Orman and John Blum while they were about. In the home straight is the last instalment of Chris Skerrow’s PDA articles, and it closes the series nicely. I don’t think any of us would begrudge the amount of effort and time re-reading all these novels must have taken, and I look forward to Chris’s next, hopefully less mammoth (for his sake) work. The issue rounds off with a short story by Lorna Fleming. It is great to see fiction making its way back into the pages of the fanzine, although I am hoping for a slightly meatier plot next time. But perhaps the most worrying thing about the issue occurs on the last page. While you can draw your own conclusions about the need for a third editorial set of hands (realisation that quicker turnaround is needed, or more basic executive grooming? ), there seems a tacit acknowledgement that we’ve slipped again from being bi-annual to now “once a year (twice if we’re lucky)” …and nunce if we’re not. And given that one has to ask whether the latest issue suggests if it really is worth the wait? I read the new series retrospective feature fully anticipating annoyance at the usual petulant RTD bashing which seems part of a Fan’s mission statement these days, or boredom at having read it all before – but was delighted to find that I couldn’t have been more wrong. In fact, I believe fans should instead make it part of their mission statement to read this article – the most well-reasoned, balanced and insightful of its kind which I’ve seen anywhere. Special thanks to David Lawrence who convincingly reminds us of how wonderful Eccleston’s brief portrayal was, before having its memory all but swamped by Tennant’s ‘in-ya-face’ interpretation. This brings me to the last (actually the first) of the big three articles – the final part of the extensive look at Graham Muir’s cartoon creations. Reading this I was reminded of a documentary I once saw at a film festival, about Lighthouses. Been taken to beacons all over the world by a softly spoken Norwegian narrator for two hours could have been as gruelling as waiting for Return of the King to reach it’s own final credits, but instead I found it mesmerising and all these years later, still unforgettable. What really distinguishes this article is the look at Graham’s own creative processes, well-illustrated by a ‘digital recreation’ of an unfinished Saucer strip. Fantastic stuff which really beings the subject alive. The revelation that TSV‘s special anniversary issue last year could have been graced with an exclusive Tardis Tale (but didn’t for reasons poignantly explained by Graham), adds a closing sense of regret to this series of articles. Although perceptibly affected by the unfortunate postponement of Garry Jackson’s next comic strip instalment, RTP 27 is packed with fabulous art and writing from Ood to Adipose, and once again ushers in the festive season in style. Temporal engineering is surely the only way to explain how Alex has managed to fit such an embarrassment of riches into what is still a relatively slim volume. An interview, articles, reviews, artwork, comic strips and cartoons – there’s even a crossword, for heavens sake! You can keep your official activity books – get RTP! instead. But to get inside, you must first get past the cover. Are we about to read RTP! 26, or Doctor Who and the Sorcer’s (sic) Weapon? It’s wonderful to see RTP! with a colour cover and always charming to see some artwork from a young and enthusiastic fan, but in this case the result is definitely less than the sum of its parts. What we actually have is a landmark full-colour cover which looks as if it’s been hand-drawn by a young and enthusiastic fan. Instead of taking the opportunity to enhance RTP!’s own brand by adding colour to that sharp masthead logo, we see it instead shrunk and stuck somewhere near the bottom – in black and white! Cropping, angling, or drop-shadowing the illustration might have helped to make it an element of, rather than becoming the cover so that RTP!’s traditionally clean typography could still have been maintained. Never mind there’s always the back cover, where we have – a black and white illustration! (An extremely good one, but another missed opportunity for colour, regardless). Alright, we’re now inside, and despite the terrifyingly narrow outside page margin (getting to the end of right-hand sentences is like playing chicken with the page edge, at times) RTP! 26 is, as usual, a delight. As implied earlier, there’s far too much on offer to do justice to in a short review – but three of the main features deserve focussing upon. If the 8 page first part of ‘The Tower of Angum’ was a film, I’d have to say that it’s stylishly directed; with the panel composition and content both innovative and adept at communicating the story visually. I’m looking forward to Part 2. James Grant’s reply (or rebuttal?) to Lorna Fleming’s recent TSV article ‘Planet of Fear’ is a well-researched piece which could so easily have become inflammatory, or at the very least pedantic. In fact, the Fleming TSV article is not just deconstructed with sensitivity and respect, but Grant offers equally fascinating alternative theories and observations for us to mull over. Articles like this show how much Fandom has grown up – leaving behind the days when differences of opinion often seemed centred on whether a story, Doctor or entire ‘era’ was ‘crap’ or not. Speaking of intelligent opinion, the Morgan Davie interview also contains many thoughtful and balanced views on Fandom and writing in general. Davie also communicates the enviable excitement of living in Britain as the ‘new series tsunami’ built and broke in 2005 – something the rest of us can only imagine. One might think with the somewhat subdued and narrowly-focussed response to TSV‘s 75th issue and its 20th year of existence that this issue’s success is mainly down to the masterly artwork on its wraparound cover and little lese. This is an oversight – to be sure, Alistair Hughes’ cover is a striking and vivid piece, reliably faithful to its sources and composed pleasingly on the eye, and easily the best cover in recent years; inside however, there’s more going on than just the status quo. TSV 75 is less a look back than some – ZeusBlog among them, may have predicted. Of course there’s an article by current and former editor Paul Scoones on its creation, but there’s also much of the new in the mix, and the recent – Amy Mebberson provides the highly appealing artwork accompanying the new series round-table reviews (one of the zine’s main features) and Lorna Fleming and Jez Strickley provide their own articles, respectively on the DW canon and the symboloism of the series’ traditional top-tier monsters that, while they would certainly benefit from a firmer editorial hand, are evidence of new blood. Elsewhere Chris Skerrow continues his very enjoyable voyage through the BBC Past Doctor adventures (with only one instalment remaining the series itself has been a mainstay for some issues), and Jon Preddle researches the original series’ screenings in Singapore – reading the Straits Times so we don’t have to. It’s scholarly stuff, but this sort of thing needn’t always feature in The Disused Yeti, and when it’s put together as well as this, even no news of old footage being unearthed is worth publishing. Oh, and a special mention to the continued Drabble Who Challenge section, particularly the rather fun entry by Tim Beverstock. We didn’t know you had it in you, lad! So it’s a decent mixture of old and new, with solid long-term contributors like Jon and Neil Lambess boosting the page count while newcomers are bedded in and Ms Mebberson’s artwork gives the zine some well-needed breathing space from all those lines and lines and lines of text. There’s even some extremely fannish fun to be had with the Vote Hi Fi article linking (and I use that term very loosely) The Chase with Series Three. As an anniversary issue there’s nothing ‘special’ here (the dropped ball that is no Sylvester McCoy interview after his second visit to NZ in three years is puzzling and warrants explanation), but there’s enough for a few sessions’ read rather than a hurried cover to cover dash. And why not – after twenty years of Her Majesty’s Fanzine and with the series back on air there’s every opportunity for a leisurely leaf through the pages, right? Before anything else can be said about the latest issue of RTP, heartfelt congratulations on the silver issue and tenth year of publication has to come first. Important milestones of which everyone involved should feel justifiably proud and deserving. God rest ye, merry gentlemen! In the always entertaining letters page David Ronayne makes an impassioned, and as it happens successful, case for dropping the ‘alternative NZ Doctor Who Fanzine’ from the masthead. It’s a good letter, but untimely for my review because given that the ‘other’ New Zealand Fanzine celebrated a significantly numbered issue and very important birthday, and saw its release on practically the same day as RTP 25, it’s very difficult not to make comparisons. So I’ll refrain, except to say that I have always seen the ‘alternative’ moniker in the same context as ‘alternative lifestyle’ or ‘music’ without ever having thought of RTP as a specific ‘alternative’ to the other three-lettered Fanzine. It just isn’t. October 2007 marked the tenth anniversary of Christchurch fanzine Reverse the Polarity! -not bad for what used to call itself the ’alternative’ zine in this country. While it has also just hit issue 25, ten years’ survival is more than noteworthy – after all, its nearest counterpart in longevity was the same age when RTP! began. 2. …which means that beyond initial editors Matt Kamstra’s and Wade Campbell’s desire to beat Telos‘ run, RTP! has – as of issue 25 in fact done so by ten. 3. Issue 2 saw the debut of Brendan Gibbons’ wonderful Cyberguy, which ran for a glorious ten installments before disappearing forever. Ahh, shame. 5. And we are now ten issues since the debut of stablemate Bob the Suicidal Dalek. 6. Ten cartoons. Not comic strips, no sir – so besides the ‘serious’ fare of Pulp Who, Cydonia, Myrhh and others the roll call follows: Birdy, Saucer, Cyberguy, Spliff and Nutmeg, Ergon, Aquaman, Bob the Suicidal Dalek, Teletubbies in the Death Zone, Unconvincing the Animatronic Cat and – just about to make his feature debut, Cyberman the Kroton. 7. And speaking of hiatuses, ten issues ran in slick timing before RTP‘s own period of silence, with the departure of Alex Ballingall to Japan, and the disappearance of Matt Kamstra, who would not return to the editor’s chair after issue 11. 8. But back to Cydonia for one more time. 2007 marks the tenth anniversary of Cydonia last appearing in Telos. At (ahem) twelve years old, Cydonia is surely NZ’s longest-running Who comic strip. And it’s about to finish at last. In the pages of RTP! 9. Issue 25 is ten issues past the conclusion of Pulp Who (from issue 2) the longest serialised comic strip to date. 10. Finally, ten years since TARDIS Tales ended, and its star Saucer Smith launched RTP! as its first cover star. A full retrospective has just finished on the strip series in issue 25, with a new collection out soon through RTP!